We often overlook the importance of a good gaming chair. Any serious gamer worth their salt has top-of-the-line equipment in their setup. High-end gaming desktops, high-resolution gaming mice, great gaming monitors and are among them. Why not expect the same with your gaming chair? You need to consider with the same importance as any gadget you have, the chair you sit on. One should invest in a quality piece of furniture, especially if you plan to spend long hours seated. That is true for anyone doing professional photo or video editing and especially gaming. This guide will take you on a tour of the fundamentals in making your next gaming chair purchase. We will also be reviewing budget gaming chairs, mid-range, and high-end models. This will help you find the chair that fits you best, whatever your budget. What do ergonomic gaming chairs offer above the standard office chairs? The average office chair is primarily designed for productivity and not comfort. They are made for offices that expect people to work 8 hours daily. Whether they’re comfortable is another issue altogether. These chairs are usually of poor quality, and rightfully so. That is because the materials used for these chairs are the bare minimum of what office chairs should be. Often, you can even feel the nuts and bolts underneath the foam brushing against your back. Spending long hours on these chairs will give you a strained back. It also does not have the right ergonomics that provide comfort and correct posture. Both are essential to people spending long periods of time seated in their chairs. There is one excellent reason to buy one of the best gaming chairs in 2016. It is as much part of the gaming experience as your high-end graphics card. 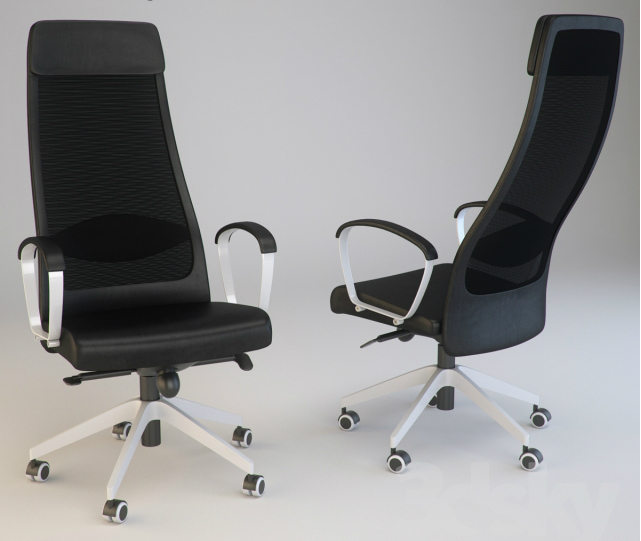 Gaming chairs will also last longer and will be made of better materials than your average office chair. Some chairs even have headrests, audio features, as well as tilt angles regular seats just cannot reach. It will also surely be part of your rig for decades due to their superior quality. In this article, we will be using the word “gaming chair” which is a misnomer. The reason for this is that these chairs will often be improved versions of office chairs. Some of these chairs are made to look like racing chairs, with the obvious red and black color. We will be reviewing chairs that are not necessarily “gaming” chairs but benefits any gamer. Let me preface that purchasing a gaming chair is no means a guarantee that you will be victorious. Not unlike your gaming mouse or mechanical gaming keyboard. Primarily, there are two main types of gaming chairs in the market: PC and Console gaming chairs. These two are very different. One is made for the PC and the other for Gaming Consoles. Console chairs are generally placed on the floor or a few inches higher with a pedestal. PC gaming chairs are designed for sitting at arm’s length and height for a computer desk. 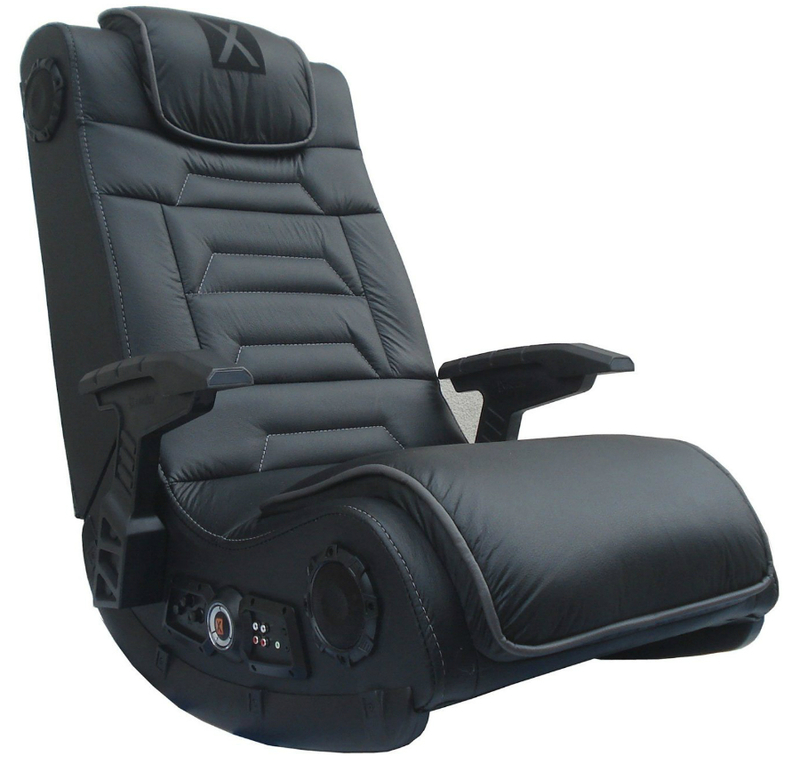 A Pedestal Gaming Chair is the most popular chair on the market. It is supported by a pedestal which brings it a few inches off the ground. 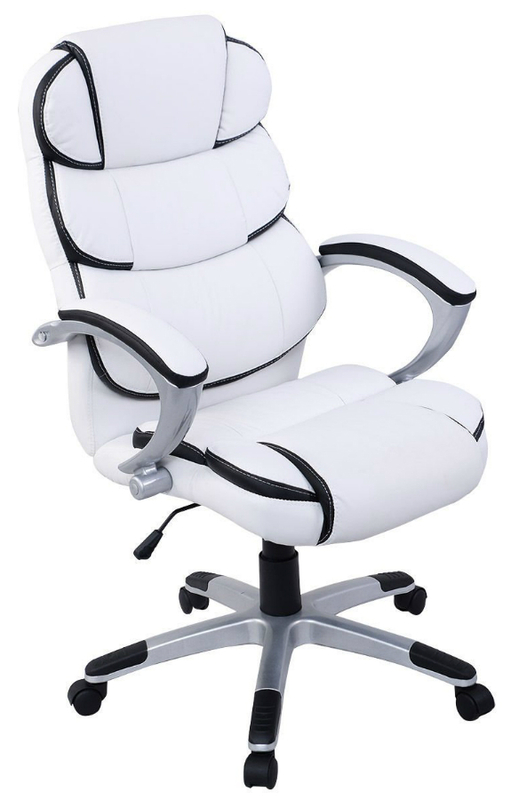 Pedestal Gaming chairs can swivel in any direction. These chairs are usually made out of leather or synthetic fabric. Some are even outfitted with audio options to immerse you in the gaming experience. These chairs are typically intended for use with a gaming console. They do not offer the height required for PC gaming. Rocker chairs are primarily the same with the pedestal chair, without the pedestal. These can be mounted on your couch or simply laid down on the floor depending on the desired height. These chairs also do not swivel. PC Gaming chairs are made specifically for PC gaming. These chairs are usually of desk height but can also be adjusted for both tilt and height settings. Good quality PC chairs will also have many other features. These chairs normally have a headrest, an armrest and offer excellent ergonomics. They also offer insulation at the back that provides superb comfort while playing. These chairs are specially made and engineered for playing racing games. 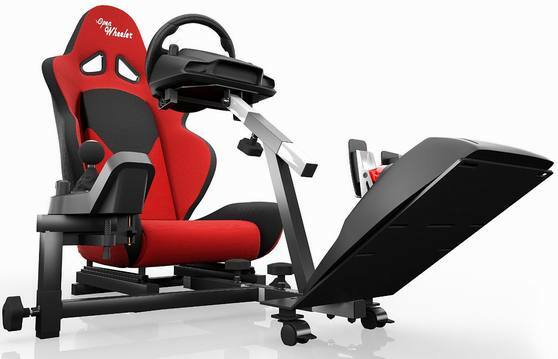 This chair makes you feel like you’re inside a race car when playing. They also allow peripherals like a steering wheel, gear shift, accelerator and clutch to be connected to it. These are features you will typically find on a regular vehicle. Racing chairs also usually fully recline to provide utmost comfort. This should be the primary consideration and best reason for buying a gaming chair. We need to think about the chairs ergonomics as this will lead to more satisfying gaming sessions. You must also consider the type of material which you are more comfortable with. Some of these chairs come in leather which might not be comfortable for some but works for others. Some chairs also have fabric materials as their covering. You should also consider whether the chairs should be able to tilt to find the best seating position. Some chairs will provide extra side padding as well as headrests to make you more comfortable. The second most important thing to consider is the materials used on the chair. This will eventually determine how long your chair will last. Some chairs have steel supports which are more durable than their plastic counterparts. You should also consider the material used where you will be sitting. Leather, while comfortable, is a delicate material. They risk scratching as well as stretching from regular use. Fabric, while not as comfortable as leather, will last longer and require less upkeep than its counterpart. Sturdiness definitely plays a big factor when purchasing a gaming chair. Size does matter when choosing the right gaming chair. There will be seats which are designed for the average user but cannot accommodate larger than normal individuals. You don’t want to purchase a gaming chair and end up straining your waist. Make sure you buy a chair that is sized proportionately to you personally. Most gaming chairs will already provide you excellent stability, durability, and comfort. Even without all the extra features. 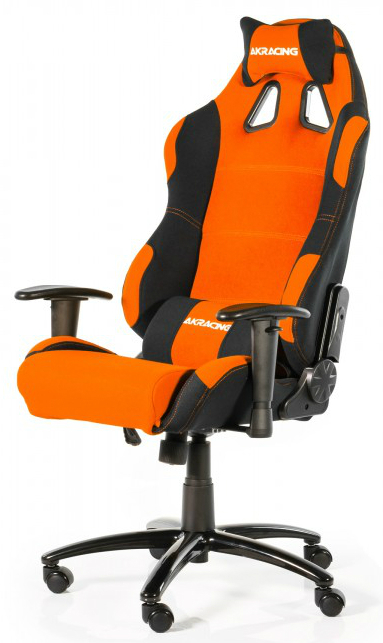 A significant number of gaming chairs offer features which make them unique. These features are of course just an add-on to an already great and comfortable chair. They will also make for a superb gaming experience as well. Some seats offer additional side speakers. Some have I/O ports for consoles and wireless receivers. Some others have buttons that adjust the chair’s orientation. The last factor to consider when buying a gaming chair is its price. More often than not, we consider this first for the obvious reason of economy. In the case of gaming chairs, just like any purchase, we get what we pay for. The price tag should not exclusively decide this decision. A sub-$100 dollar chair will usually end up being not as durable as expensive ones. This will also translate to countless hours of distress especially when you spend long hours in the chair. What we need to look for is good value in a gaming chair, whatever the price range. You need to make sure that the chair is well built and will last you many years. You need to invest more to ensure that the seat is worth the hard-earned money. The Office Star ProGrid FreeFlex offers the best bang for your buck when it comes to gaming chairs. It has a breathable material on the back which gives comfort for those long gaming sessions. The best thing about this chair is that it has three adjustment modules for the height. It also has adjustments for the back, as well as controls for adjusting the armrests. These give you the best position possible. Its appearance is pretty much on the basic side compared to its rivals. But it certainly does the job for much less money. The X Rocker 51259 Pro Gaming Chair is widely popular within the gaming market, and with good reason. It’s got a lot of bells and whistles under its seat. It comes with four speakers: 2 of which are located on the bottom of the chair. It also has two located on either side of the headrest, a subwoofer and vibration mechanism. These subs sync to the bass tones of the audio to make sure you feel the sound being played. It also has a built-in radio wireless receiver which works with RCA outputs. Its primary material is fabric and as such, can easily be cleaned using a wet towel. 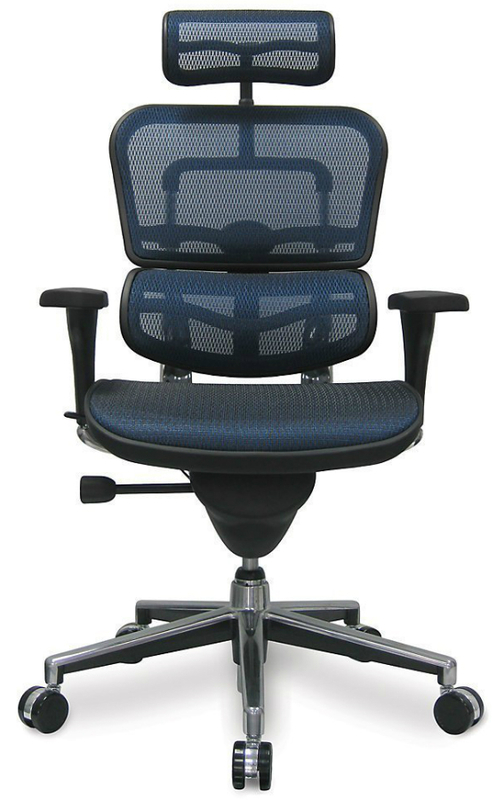 The chair also has excellent cushioning as well for your back with its pleated padding for ergonomics. As a rocker chair, this is usually mounted on the couch. You can also put it on a pedestal or the floor for console gaming. 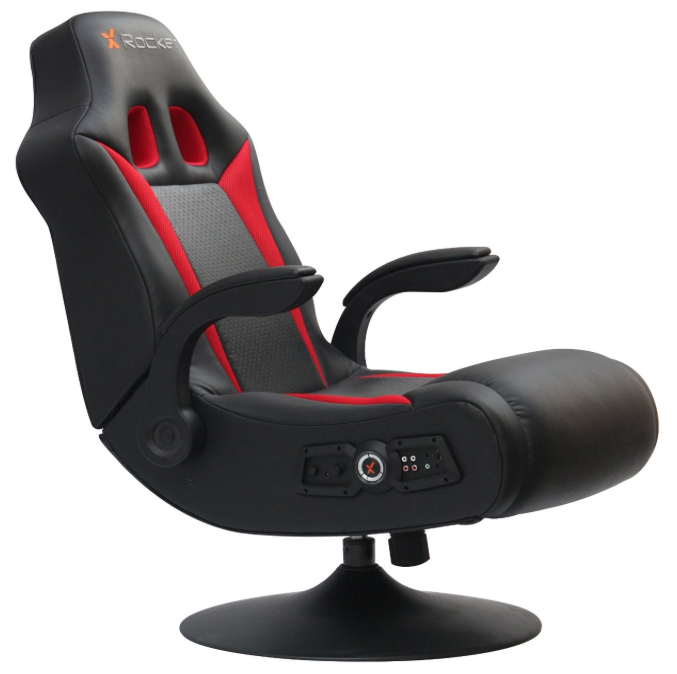 Another X Rocker chair makes our budget gaming chair list: introducing the X Rocker 5172601 Rocker Gaming Chair. This chair has slightly better audio system than its brother above. It comes with two 2.1 speakers one on either side of the headrest. It also has a subwoofer with AFM technology. This ensures that this chair is the sweetest spot for your sound. Additionally, another feature makes it unique from the previous model. It is equipped with a Bluetooth receiver that can receive input from any Bluetooth-capable device. This means you can have any Android or iOS phone paired with this chair. Enjoy all the quality sound without leaving the seat. The Giantex Ergonomic Leather Chair is among the ranks due to its sheer comfort. Obviously, as a PC chair, it doesn’t have all the features of the previous models we discussed. At $129.99, this chair is hard to beat with providing the highest comfort. This is further shown by the leather-padded armrest as well as padded back and seating areas. The chair can support huge loads as it is of metal support construction. 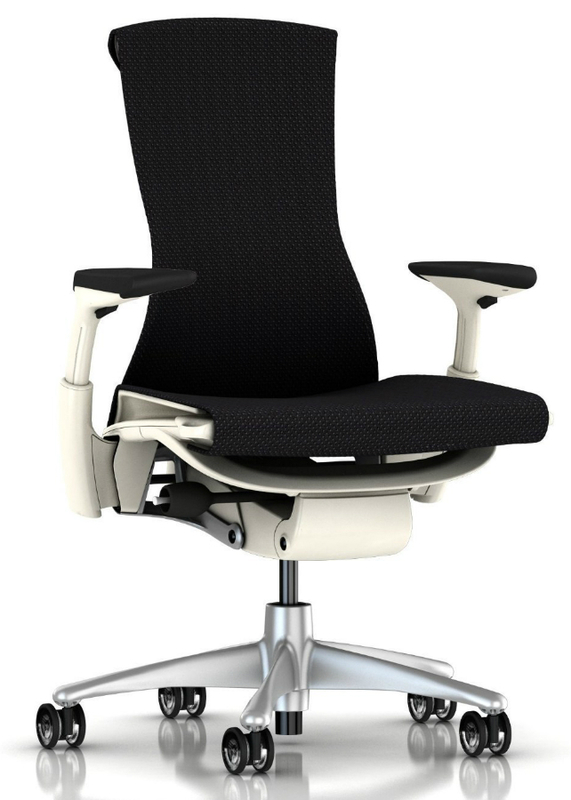 The chair has regular office chair features as well like the 360-degree swivel. It also has pneumatic gas lifts and adjustable height for the best-sitting position. The PU leather is easy to clean as well. The Yaheetech Adjustable High Back Gaming Chair comes as the last contender in the budget gaming chair category. It looks like a racing chair combined with an executive office chair look. This is due to its faux leather and nylon construction. The chair comes with full leather paddings, including the armrests as well as adjustable tilt and height settings. The chair is very durable as the base is made of steel and a load capacity of 550lbs. This chair comes in other color combinations: Black, Black/Red, Black/Blue, and Black/Yellow. Overall this is a very comfortable chair that has a price that’s hard to beat. Any of these budget chairs will help you save your money and get the best value. Let’s now move on to our selections in the mid-range price margin. The question on everyone’s mind is whether you need to spend a pretty penny on a gaming chair. For me, the answer is an absolute yes if you want top-notch comfort. Gamers who play RPGs will require long hours of sniping and focus. These chairs will definitely give you an advantage to that end. 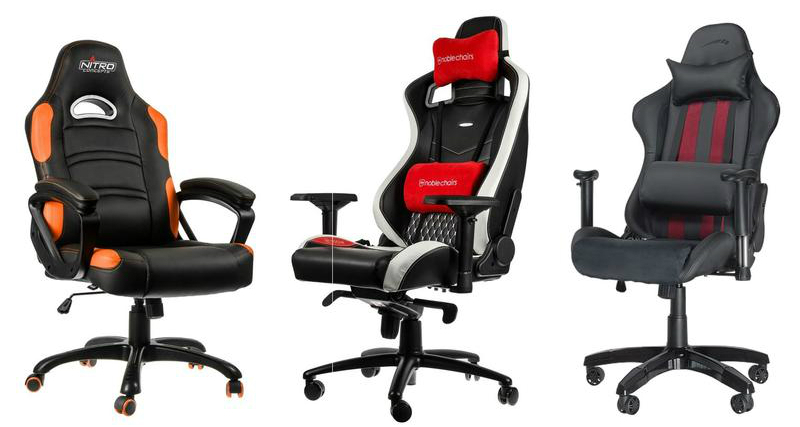 The DXRacer Racing DOH/RW106 comes in a variety of flavors. This review applies to most of DX Racer’s Racing Series range. The chair is widely popular and can be found in many a gamer’s stations. The reason behind its popularity is that the DX Racer has a very ergonomic design. It also comes with very sturdy materials and construction and has user-configurable adjustments. It has high backrests that support your head and spinal column. This makes it a great chair that maintains proper posture. Another feature most gamers look for is the mesh seats and the PU cover combination. The chair can be swiveled. The back is also adjustable to a very wide angle, to almost a reclined position. The arm rests are also adjustable in most models which can be customized based on your seating position. The chair also comes with a variety of colors to choose from to match your gaming setup. 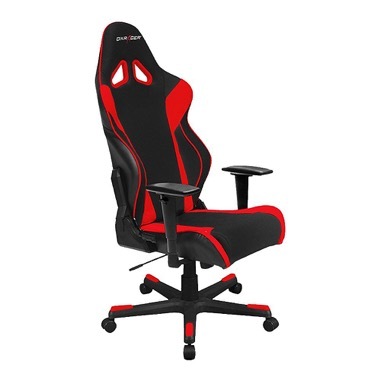 This chair is great for playing competitive games that require focus and comfort. If you play RPGs and games which require focus, this chair is for you. Priced at $299, this is not the most inexpensive chair in the range. The chair provides great support, comfort as well as being customizable to any position you would require. But at this price, there are far better options than the DX Racer when it comes to comfort. The reason to purchase the DX Racer is to give your setup a gaming look. The Swedish furniture giant’s offering is not specifically a gaming chair. 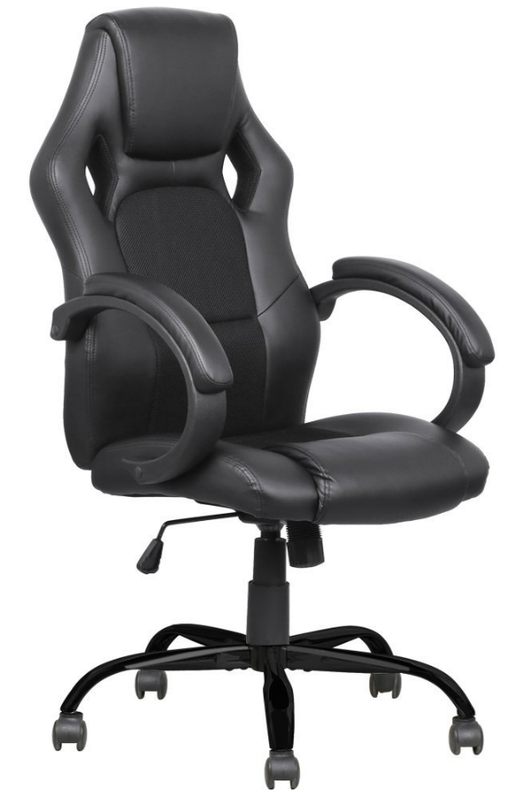 It is a PC chair that offers outstanding quality at a price point of $199.00. The chair has a high-back with a minimalist design. The design is exactly what you would expect from IKEA. The chair is also very inexpensive considering the materials used in its construction. Both the seats and the headrests are made of leather. The base is made of very sturdy material. Additionally, the chair has lumbar support. This maintains good posture and provides comfort. It is also designed ergonomically to follow the curvature of your spine. The backrest goes up to 40-degrees, and one can adjust the height of the seat. The chair is painless to set-up and users have given this chair their approval. The only thing you should watch out for is that since the chair has a very tall back. Depending on your height, your head may not rest on the headrest. The chair comes in four colors from IKEA. It comes in Gloss Black, Visser Gray, Vessel Beige, and Vessel Dark Gray. It meets all the standards of a good chair too. It complies with anti-flammability requirements and EN 1335-2 and ANSI/BIFMA x5.1-2002. This means that it is very durable, stable and a safe piece of kit. IKEA provides the Markus chair with a 10-year warranty. This gives you peace of mind when purchasing the chair. 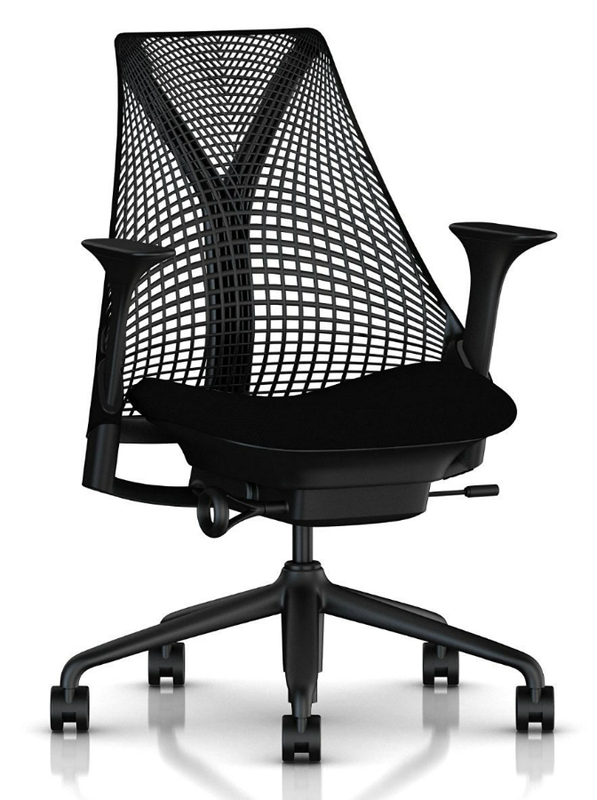 Herman Miller is known for beautiful design, first-class ergonomics, as well as elegant engineering. The SAYL chair undeniably has all of these qualities. It is minimalistic simplicity is what’s best about this chair and will certainly complement any setup. The tilt feature of the chair is one of its best attributes. It provides you the liberty to recline it in 91, 101 or 124-degree settings. The back netting allows cooling as well as a nice design feature of this chair. The chair has built-in Posture Fit technology. The vertical and horizontal suspension back provides support. They essentially tilt your hips faintly forward. This keeps the spine in healthy alignment for improved posture and comfort. Users highly recommend this chair noting that it has even helped them with back pain. Priced at $499, this chair is definitely not cheap. But this chair will definitely last a lifetime and look good while doing it. 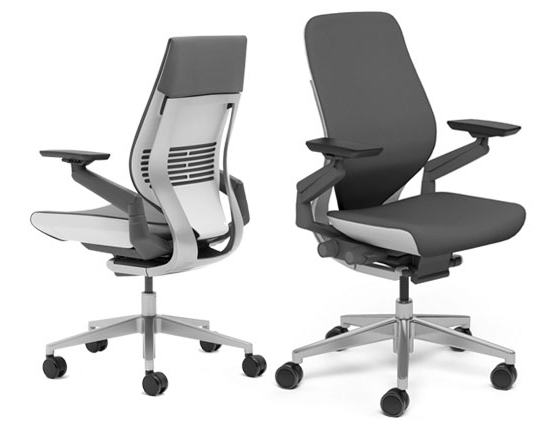 The Ergohuman Chair by Ergohuman is exactly what its name suggests – great ergonomics. This chair gives you multiple settings for you to find your optimal seating position and comfort level. The mesh fabric at the back and seat also allows the user to keep cool. It allows great air circulation all throughout the back and bottom of the chair. The support is made out of aluminum which means that this chair will last you many years. This also has a wide seat so larger individuals will be able to sit comfortably in the chair. 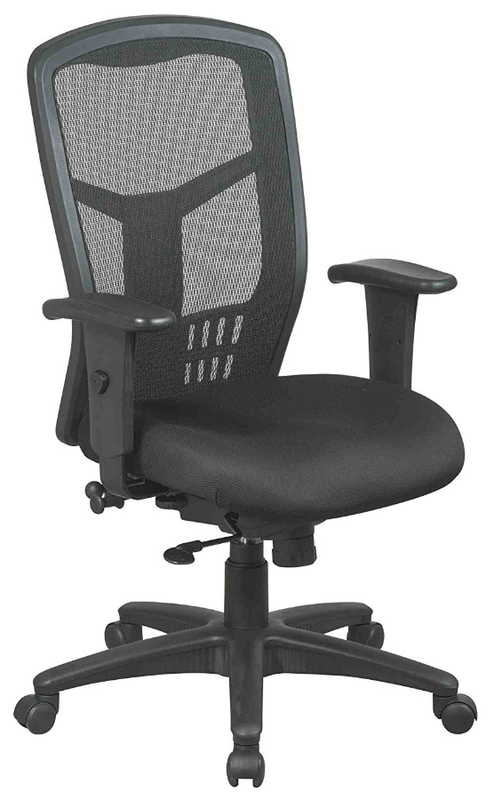 The chair has a three position tilt-lock with tilt tension control. This lets you find the best position for your comfort. The chair also has lumbar support and a strong, flexible frame. Priced at $624 for the base model, this is not a chair for the budget conscious. It is also customizable to leather, which will add $50 on top of the price. It’s definitely an excellent option for those who need the absolute best in ergonomic support. The chair also offers comfort and durability. This chair is for people who log more than 9 hours on their PCs. Finally, we’ve come to the summit of gaming chairs. You spend over $500 on a TV for your gaming rig. The quality of the chair in which you enjoy them should be consistent with that amount. These are the best gaming chairs that money can buy. The Steelcase Gesture is definitely at the height of comfort and ergonomics. For a chair with a lot of features, it has a simple and minimalist look. This chair is definitely the Bentley of gaming chairs. The Steelcase Gesture’s seat is made of memory foam padding. This adjusts as you sit and is the best thing in luxury seating and comfort. Its armrests have the Gesture 360 technology developed by Steelcase. It is designed to optimally adjust to whatever your activity is. The armrests adjust whatever your activity. Whether it be holding a cellphone or an iPad, or simply typing. The armrests are also adjustable any size. They can swing inwards and outwards to allow for optimal arm support whatever your size. At $1210, the chair doesn’t come cheap – and most quality chairs don’t. The Steelcase Gesture is made of very durable materials. Its frame construction is of reinforced steel and has a lifetime warranty from Steelcase. This assures you that this chair will last for years on end. 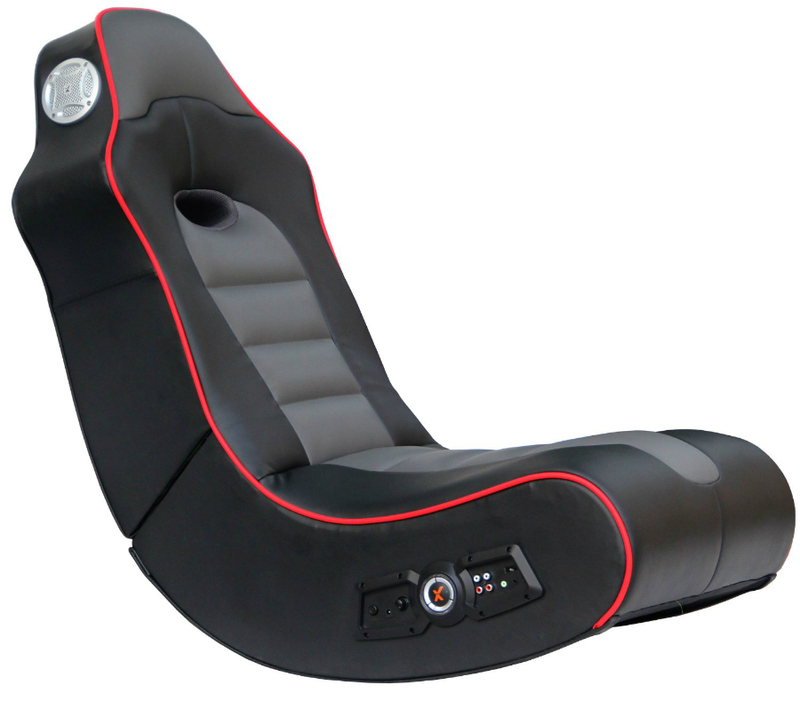 The Openwheeler Advanced Racing Seat is suitable for both gaming consoles and PC. This is because it does not come with floor support. The seat can simply be mounted on your couch. The seat is compatible with all gaming console models (PS1, PS2, PS3, PS4, Xbox 1 and 360, Nintendo Wii, GameCube, N64, SEGA) as well as PCs. The seat is also very stable and flexible. It has adjustable locks on all its sections which you can adjust according to your desired driving position. The racing car seat is also very realistic and lightweight. Another nice detail to have is that the system also supports left or right-hand drive. Priced at $399.00, the chair is a bit on the expensive side. Rest assured; this beauty is definitely a simulation driver’s dream come true. The Embody Chair by Herman Miller defines perfection in my opinion. At $1400, this chair is definitely not inexpensive. It makes up for that with its ergonomic functions as well as a beautifully crafted body. You can also tell it has a durable construction with the steel base. The chair is a comfort to sit in, yet not too comfortable for you to doze off. It sports six ergonomic adjustments to help you get in the right posture and reclines too if needed. According to Herman Miller’s website, the chair helps to improve blood and oxygen stimulation in the body. It also reduces spine compression and even slows fluid loss from discs. It also has a “skin-like” fabric that allows air to circulate. This keeps you cool no matter how long you are seated in the chair. The chair also comes with a 12-year Herman Miller warranty. It also includes an official Born-On-Date sticker. If you’ve got money to spare, this chair certainly is the pinnacle of comfort. Casters and wheels are just as important as choosing the right Gaming Chair. Many don’t look for this feature. You could benefit from looking at modifying the wheels of your chair. First, let’s give you a brief background. Casters and wheels are the devices that make the chair move without the person lifting the chair. By default, the manufacturer will supply office and gaming chairs with their stock casters and wheels. The only danger with them is that it could damage your floors. By modifying your stock casters and wheels, you can further improve the product that you purchased. You could also save your floor of roll marks as well. Thankfully there is a very wide selection of casters and wheels available in the market. They not only eliminate scratches on your floor, they even stop the chair from unnecessary movement. Replacing casters are of course optional and can void your warranty. Changing it can significantly improve the functionality of your chair. 1. Rigid Caster. Rigid Casters are an older type of caster which remains stationary. This means it is limited to the forward and backward motion. You will not have the option to move diagonally or sideways with these types of casters. a. Kingpin-Less Casters. These casters are the most heavy-duty casters available since it doesn’t have a nut and bolt kingpin. If you need anger management after a gaming loss, this is the one to buy. b. Locking Casters. These casters have a locking mechanism which will “lock” the chair into place. This prevents any unwanted movement. c. Plate Casters. The Plate Caster comes with a “plate” that is attached underside of the chair. 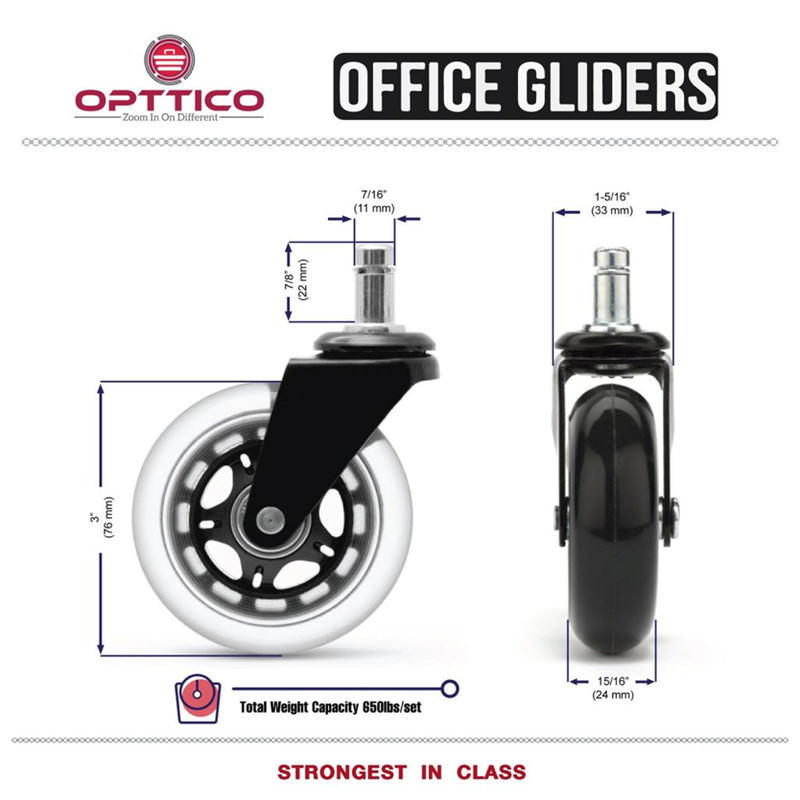 Office Gliders Office Chair Caster Replacement. These casters are of PU (polyurethane) construction so they will not damage your floors. They are also built so that they do not create noise during operation. The best thing about these casters is that they’re very easy to install. 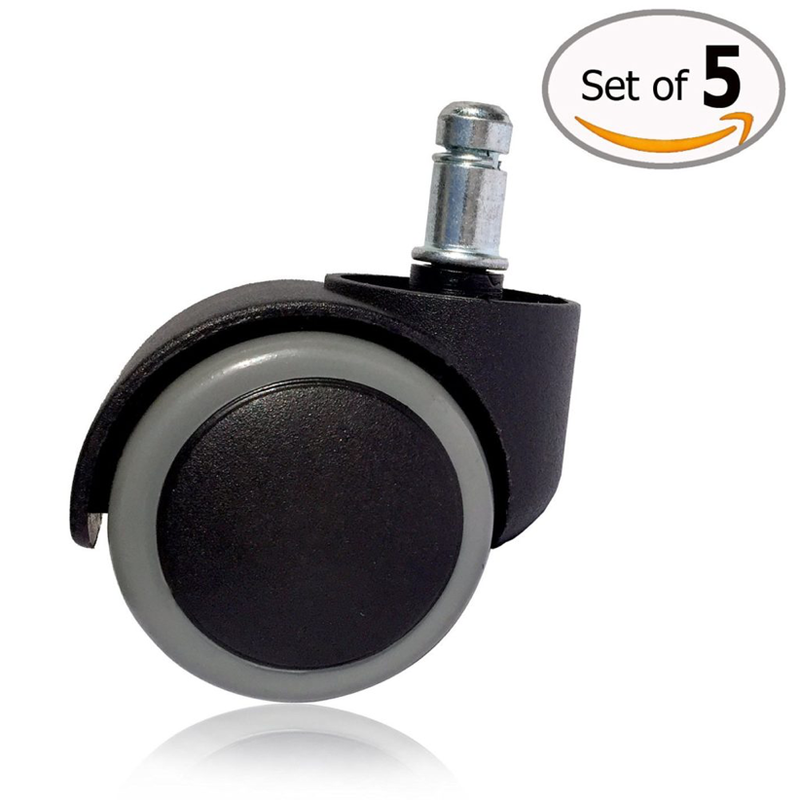 These casters are also made of polyurethane and will not damage your floor. This goes with whatever surface you have in your home. They move smoothly due to the Lithium-based grease. They are also easy to clean and will match the color of any gaming chair. 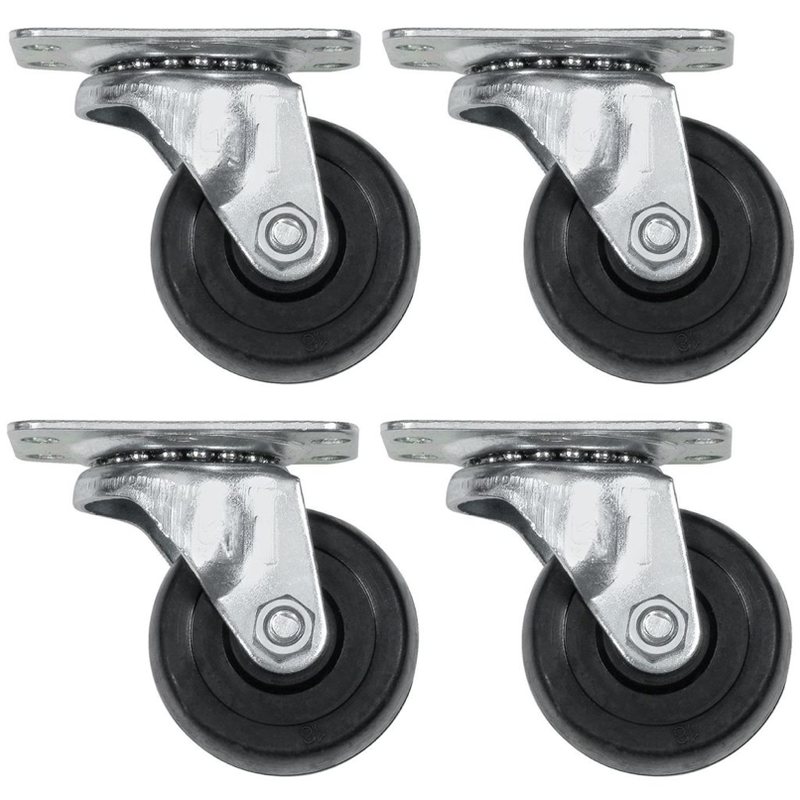 Reliable Hardware Company Casters Replacement. Last but not least, the casters from the Reliable Hardware Company is very popular online. They were awarded #1 Best Seller award on Amazon. They are a plate-type swiveling caster that can be placed on gaming chairs easily. It’s the only caster that is made of rubber and glides through any surface with ease. Again, Gaming Chairs should not be ignored especially if you log huge man hours on your gaming setup. Not only do they have nice aesthetics, but they also help you be a better gamer. They also improve your posture and providing you with great comfort. Just make sure you remember all the points we talked about earlier. Then you can choose the chair that best suits you and your style. Hopefully, this article has helped you decide and has given you enough information to go on to make that all important jump on investing not only in a quality chair but also on your comfort and posture.